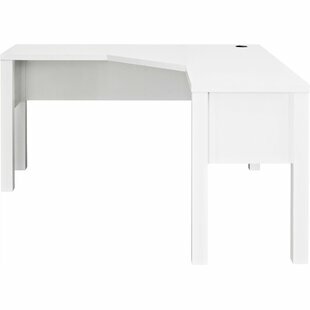 Simple and versatile, this compact computer desk is the perfect workspace in a home thats a bit short on square footage. 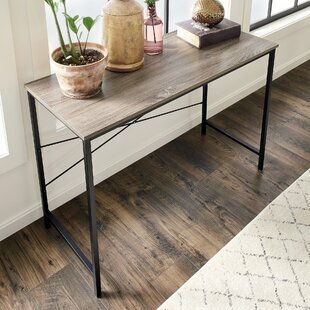 Its casters let you easily move between rooms if you like to craft in different spaces, while its versatile two-toned espresso and black finish blends seamlessly into an existing arrangement. 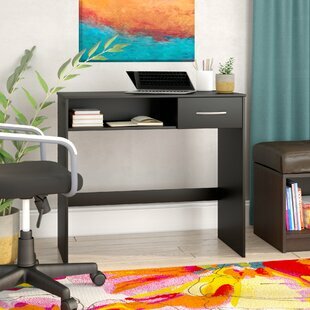 Crafted of manufactured wood with laminate, this budget-friendly piece is complete with a sliding keyboard tray so you can set up your desktop and tackle your taxes in any room. Top Material Details: Composite wood Assembly Required: Yes Overall: 30 H x 23.5 W x 19.8 D Product Warranty: 1 Year Overall Product Weight: 17.6lb. 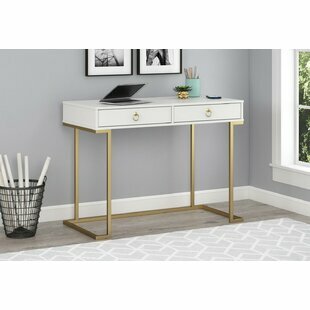 This classy and effortlessly stylish Computer Desk with Hutch is a versatile addition to your home decor. Its simple, yet elegant look merges well with any modern or contemporary home settings. 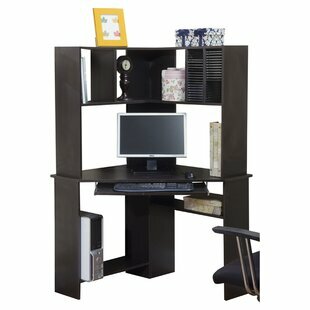 Constructed from top quality manufactured wood, this work center is durable and robust. 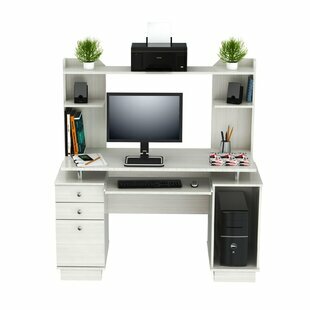 Sporting a serene and calming finish, this work center brings a sense of immense tranquil in to your room. The brass hardware items sport a lovely brushed nickel finish that enhances the overall appearance of this... Assembly Required: Yes Overall: 49.81 H x 49.81 W x 19.5 D Product Warranty: 5 Year Limited Overall Product Weight: 92.25lb. Assembly Required: Yes Overall: 39.5 H x 42.2 W x 19.7 D Product Warranty: 30 Days Overall Product Weight: 55lb. 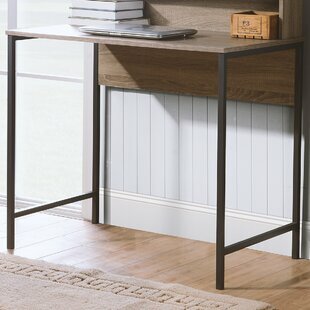 Bring clean, contemporary style to your home office with this streamlined writing desk. 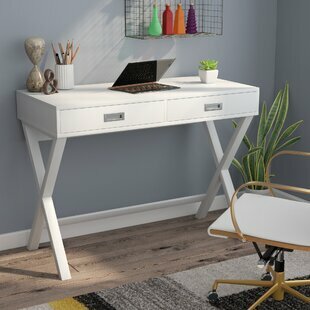 Crafted of solid wood in a classic painted finish, this desk strikes a campaign-style silhouette with a clean-lined rectangular tabletop and X-framed trestle base measuring 30" H x 40" W x 19" D overall. Two drawers with inset metal pulls offer ample space for stowing away documents and office supplies, while the smooth, flat desktop provides a perfect platform for your laptop and accessories. Assembly Required: Yes Overall: 30 H x 40 W x 19 D Product Warranty: 1 year Overall Product Weight: 48lb. 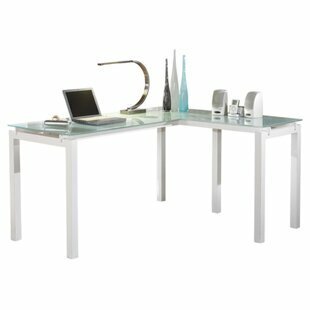 This desk delivers the functionality you crave with the modern style that suits your taste. Frosted glass appears to float over the streamlined metal base. L-shape design sets up two different ways, enabling left-handed and right-handed users to maximize the workspace. Top Material Details: Glass Assembly Required: Yes Overall: 30 H x 61 W x 50.88 D Product Warranty: 1 Year limited Overall Product Weight: 87lb. 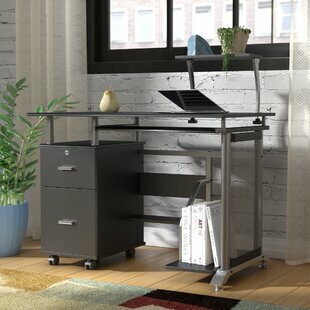 Take advantage of every corner of your office with this essential writing desk, designed to fit smaller spaces. Measuring 61 H x 35.5 W x 35.5, it takes on an angled shape and features five shelves and a keyboard drawer to keep all your working essentials on hand. Understated enough to work in any aesthetic, its melamine frame is defined by a clean-lined silhouette and a neutral solid finish. Assembly is required. Assembly Required: Yes Overall: 61 H x 35.5 W x 35.5 D Overall Product Weight: 90lb. 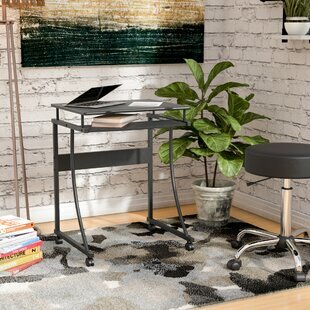 This straightforward desk offers up contemporary style and plenty of room for your laptop, notebooks, and other writing materials. 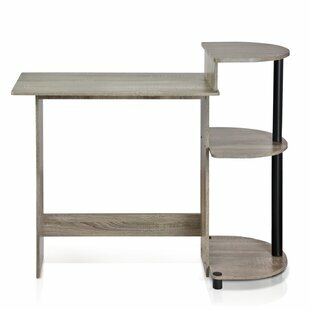 Founded atop an x-shaped metal base, this design showcases a laminate top with a beveled edge, while a protective ledge keeps everything corralled. 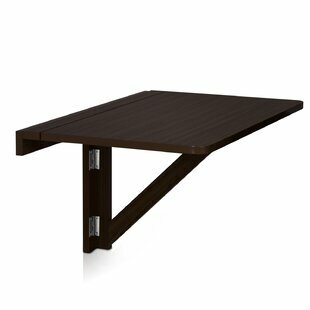 Measuring 31.5 H x 47.25 W x 23.63 D, its an unobtrusive and stylish addition to any home office. Plus, this item comes backed by a two-year warranty. Assembly Required: Yes Overall: 31.5 H x 47.25 W x 23.63 D Product Warranty: 2 Years Overall Product Weight: 38lb. Make the most out of your workspace while keepinig things neat and tidy with this clutter cutting essential, perfect grouped with desk organizers, bookcases, and trinket boxes and more. Pen thank you notes in the study or arrange a vignette of framed photos in the parlor with this essential writing desk, featuring a streamlined design for mod appeal. Instantly refresh your office or study with this chic desk, perfect grouped with stately leather side chairs, eye-catching persian rugs, and more.... Top Material Details: MDF Base Material Details: MDF Assembly Required: Yes Overall: 29.25 H x 47 W x 20 D Overall Product Weight: 38lb. 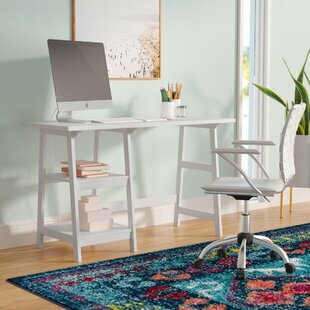 Anchor your office or study ensemble with this clean-lined desk, showcasing a space-saving corner design and perfect for everything from DIY craft projects to penning letters. Top Material Details: MDF Assembly Required: Yes Overall: 30 H x 42 W x 28 D Overall Product Weight: 42lb. 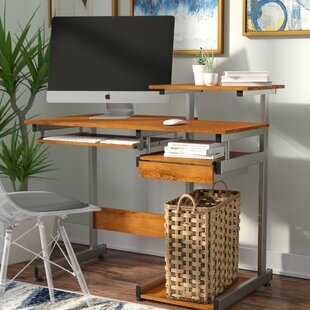 Add this Standing Desk to your home or office for stylish organization! 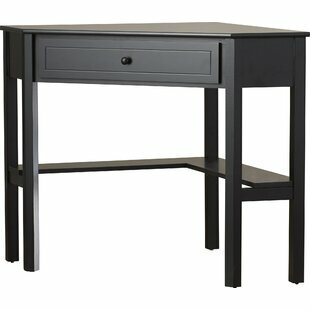 Designed with modern, simple appeal, this desk would fit perfectly in an office or even as an entryway or sofa table. 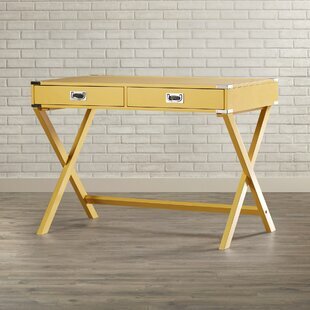 This desk is ideal for laptops, office supplies, decor and so much more. 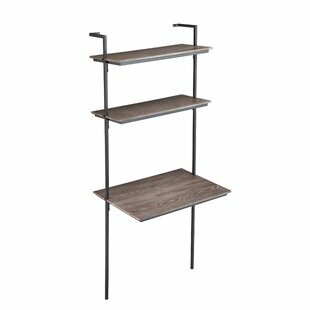 Top Material Details: Laminated Wood Base Material Details: Steel Assembly Required: Yes Overall: 29.53 H x 43.31 W x 17.72 D Overall Product Weight: 22.5lb. 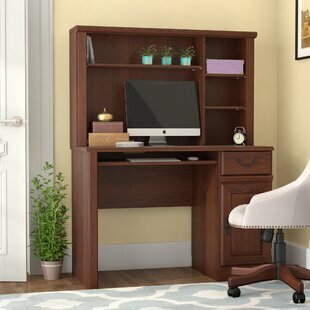 Crafted of manufactured wood in a stylish wood grain finish, this contemporary computer desk strikes a rectangular silhouette with recessed paneling, cup pull hardware, and four tapered square legs. Two side drawers offer out-of-sight storage for accessories and supplies, while a keyboard tray keeps the expansive, melamine-coated desktop clear for your laptop or monitor. 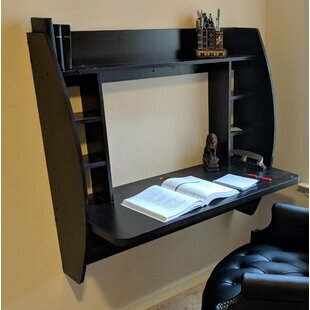 Rounding out the design, the partitioned hutch lets you sort mail and files, a grommet hole keeps wires organized, and a... Top Material Details: MDF Base Material Details: MDF Assembly Required: Yes Product Warranty: 1 Year Overall Product Weight: 76lb. 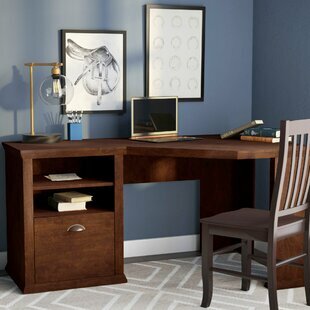 Set the foundation for a stylish and understated workspace with this classic executive desk, featuring a timeless wood base and clean-lined silhouette. Set it against a light gray wall in your home office to complement its dover oak and dark slate finish, then set down a tan-hued wool rug below to tie the neutral palette together in effortless style. 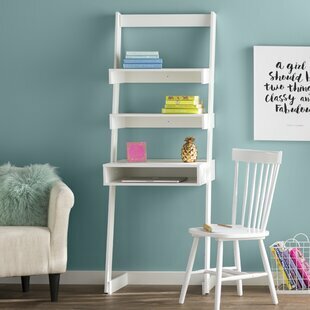 Featuring two lower shelves and a single drawer, this desk abounds with storage solutions for your space. Use the long shelf to arrange books and... Assembly Required: Yes Overall: 29.25 H x 59.06 W x 58.74 D Product Warranty: 5 Year Overall Product Weight: 127lb. 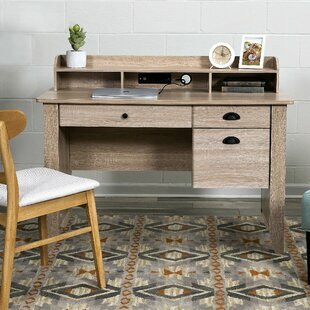 Complete your office or study ensemble with this Homestar desk, featuring a built-in hutch design. Set up your laptop and keep office supplies on-hand for a simple work space or let it be a rotating stage for crafts and DIY projects. Top Material Details: Particle board Assembly Required: Yes Overall: 35.91 H x 35.43 W x 20 D Product Warranty: 1 Year Overall Product Weight: 24.8lb. 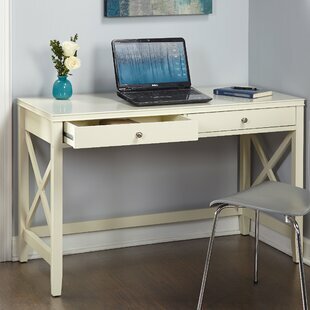 Turning an empty corner into a well-edited workspace is as easy as adding this writing desk! 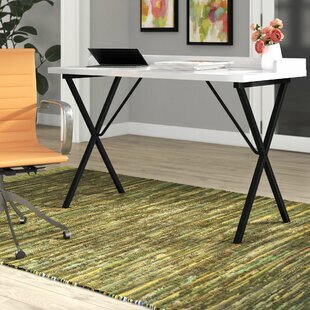 Its four legs feature an x-shaped accent that adds style as well as stability, while its top showcases the clean lines inherent to modern styles and plenty of space to spread out as you tackle todays to-do list. Crafted from manufactured wood, this design measures 30 H x 47.75 W x 22 D and features two drawers perfect for stashing workday essentials. Top Material Details: Medium density fiberboard Base Material Details: Pine wood Assembly Required: Yes Overall: 30 H x 47.75 W x 22 D Overall Product Weight: 57lb.